McIntosh announces MCT500 SACD/CD transport | What Hi-Fi? The company's flagship CD transport costs £5995 and will be available in the UK in Spring. CD transports aren't the most prevalent hi-fi component nowadays – especially those costing £6,000. 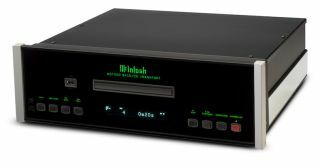 But anyone who already owns a high-end DAC and is looking for a high-end disc spinner to go with it has several options from McIntosh alone. This is the latest, the MCT500. In addition to SACD, CD, CD-R/RW and DVD-R playback, the MCT500 has a front panel USB input. Most of the popular file formats – from ALAC to FLAC, WAV (up to 24bit/192kHz) to DSD (up to DSD128) – can be played from both discs and USB drives. For hooking up to an external standalone DAC or DAC-toting amplifier, the MCT500 features three digital outputs: balanced XLR, coaxial and optical. There's also McIntosh’s proprietary MCT connection, which offers digital connection to a McIntosh product with an MCT input. A die-cast aluminum tray supposedly enables smooth and quiet disc-handling, and McIntosh says the MCT500 reads audio data at twice the normal rate to ensure better disc-tracking and error-correction processing. It's recognisably a McIntosh product with its black glass front panel and illuminated brand logo. And with its price tag, too.